A man sits blindfolded in a police interrogation room as the audience file in. “Take it off; it looks stupid,” snaps the detective who will lead the questioning. So begins Martin McDonagh’s poisoned chocolate box of a play. The interrogation teases out information and gradually more is revealed to the audience as well as the suspect, the oddly named Katurian Katurian (middle name, Katurian). He is a writer of tales so twisted Roald Dahl might baulk but, even in the totalitarian state in which he resides, that is not a crime, as such. The trouble is someone had been killing small children in ways inspired by Katurian’s stories. Worse than that, his retarded elder brother has confessed, apparently under duress, to carrying out the killings. The interrogation is broken up with recitals and dramatisations of some of the stories. The Brothers Grimm would have nightmares. It’s a grim subject, child-killing. But the violence in the stories and the copycat crimes is so bizarre, so removed from real life atrocities, we are able to be sickened, fascinated and amused all at once. Andrew Cowie is superb as Detective Tupolski, striding around like a skeletal Bill Nighy. He is purportedly the ‘bad cop’ to Brian Wilson’s wonderfully thuggish ‘good cop’ Ariel. They are a formidable double act who play the suspect like a fiddle. As Katurian Katurian, the excellent Mark Tracey holds the play together, carrying most of the emotional weight as well as narrating most of the stories. He is an appealing figure, the writer oppressed by the state, desperate to see his work survive after his inevitable execution. He has charm, vulnerability and humanity – we want him to be acquitted. Jonny Wright’s Michal is an innocent with blood (and green paint) on his hands, following his own twisted logic. It’s a well-observed portrayal and, of course, very funny. Gemma Kenny gives lively support as a “Little Girl”. The play is in itself a story, one of Katurian’s twisted tales and like the others, is open to interpretation. Liam Tombs’s production is engaging, gripping and very entertaining. I cannot fault it. It’s the funniest play about child murders you will ever see. 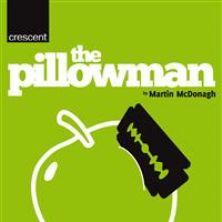 This entry was posted on Friday, April 6th, 2012 at 7:22 am	and tagged with Andrew Cowie, Brian Wilson, Crescent Theatre Birmingham, Jonny Wright, Mark Tracey, Martin McDonagh, Pillowman, review and posted in Theatre Review. You can follow any responses to this entry through the RSS 2.0 feed. Funny and child murder don’t seem ideal bedfellows. For that reason I would go to see this production to see how it was done so well. It sounds like one of those plays that I would be surprised I enjoyed. In the same way fairytales tap into what kids are afraid of, this play uses what adults fear most. Very effectively.